Grizzly bear photo, Katmai National Park, Alaska. Large male (boar) brown bear walking up a salmon stream in early morning light, fall. (Grizzly bear, Ursus arctos). Katmai National Park and Preserve, Alaska. Scroll down to see larger version of this photo. Just to post something for while I’m out of town – a brown bear photo from the grizzlies in the Fall photo tour. Edit: Well, I had initially posted this ahead of schedule, planning on being out of town this week. However, 7″ of snow and more on the way put paid to my motivation to drive through the Chugach Mountains to Wrangell – St. Elias National Park, so I’m still in town. Maybe next week I’ll get gone. On to things that matter. I wonder if he feels the same way about, say, cigarettes, or motor vehicles. Even something as commonplace as fast food diets are responsible for far more human ill health than any grizzly bear (or grizzly bear population) ever has been. When he cries for their riddance, he’ll have some integrity. 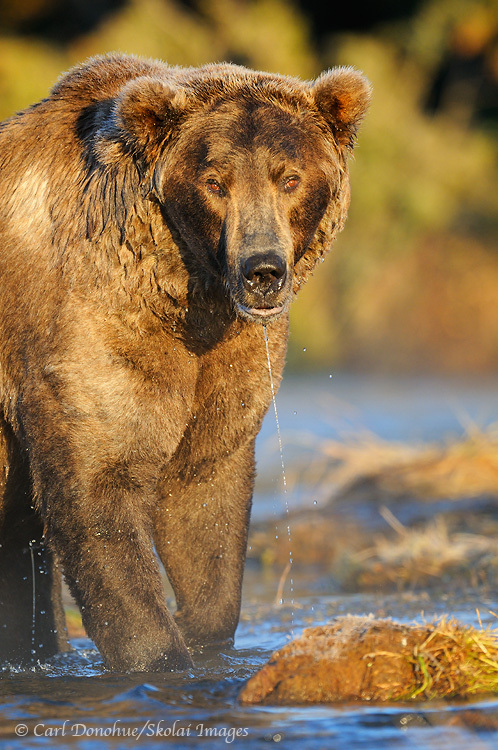 In other words, we’ve reduced the grizzly bear population to 2.8% of its former estimate. We can thank the Endangered Species Act, the good folks at US F&WS and and the resilient grizzly bear for this. When the great bear was listed threatened under the ESA in 1975, fewer than 1000 grizzly bears roamed the Lower 48 states. So, through conservation and legislation and one hardy critter, the population has risen from 2% to 2.8% of what it once was. I doubt we can thank crackpots making commentary like his above. Ignoring the theatrical stylings of his writing (“carnage”? 2 people killed in one year?) this statement simply isn’t true. The Endangered Species Act does not at all deny anyone the right to defend human life. Now, if that same grizzly bear is bearing down on your trash can, or eating the bird seed you left out, no, you are not granted the right to shoot the bear. Defense of property is not protected under the ESA. Defense of Life, however, is. If people weren’t so stupid and deceitful as Mr Fischer here, grizzly bears in the Lower 48 states might have a chance at a decent recovery and existence. That anyone would, in this day and age, perpetuate the childish mythologies from fairytales like Little Red Riding Hood and Goldie Locks is unfathomable. I simply don’t understand why anyone would carry on like this. Note also, Mr Fischer refers to grizzly bears as ‘man-eaters’. There is not a single documented, or even anecdotal, instance of a grizzly bear becoming any kind of habitual ‘man-eater’. These creatures are not the famed Lions of Tsavo, or Bengal Tigers of the Indian jungles. Even the most famous of “rogue grizzly bears” in the fables and tales of the American West, bears like Old Mose, Three Toes and Old Bigfoot, of Leopold’s Escudilla essay, were cattle and sheep killers. Not man eaters. In fact, in one of the 2 instances Fischer refers to, the grizzly bear didn’t eat anyone at all, though it did kill a man who deliberately approached it as it regathered consciousness after being tranquilized by researchers (uuhhmm .. Hello??? If one plays with fire …….). But the bear, after killing the fellow, didn’t eat him at all; grizzly bears rarely feed on humans (thank goodness). I know bears are dangerous. I’ve had my share of run-ins with both grizzlies and black bears, and will likely have more in the future. But I WANT to live in a world where creatures like the great grizzly bear roam free, where mountains are precipitous and wolves howl in the dark. It makes life a little more like life and a lot less like a spectator sport. The bear below? One of the biggest bears I’ve seen. He and one other male in the area seem to be the 2 dominant bears of the area; all the other bears deferred to them. Between the 2 of them, neither gave a quarter. But this one was much more fun to photograph; he was far more forgiving and patient of my approach – I suppose if ‘shoot on site’ includes with a camera, I’m all for it. With November well upon us, the bears are about done with their prowling and are about ready for their hibernation. Still, they’re not all in bed yet, as a kid in Seward, Alaska found out last week when he was mauled a little and roughed up by a sow he stumbled upon. Fortunately, the kid wasn’t hurt, and the bear, cubs in tow, fled. Neither the kid or his mother felt a need to adopt a ‘shoot on site‘ strategy to deal with the carnage. I hope you enjoy this photo. A large male (boar) brown bear walking up a salmon stream in early morning light, fall. (Grizzly bear, Ursus arctos). Katmai National Park and Preserve, Alaska. This entry was posted in Adventures, Alaska, Grizzly Bears, Katmai National Park, Photo Tours, Wildlife and tagged Grizzly Bears, Katmai National Park on November 10, 2010 by Carl D.
Where do these people come from? We have them in Canada also;unfortunately too many!! The english language doesn’t have enough words for this level of inanity, insanity, lunacy, stupidity, but you did remarkably well. Great post. Our culture lacks the the compassion to give animals space and respect, so we pick and choose those that we like and those that we reserve that special hatred for. And some use their status or faith to enlighten a flock of geese that can’t think for themselves. It’s truly astonishing and I suppose it’s gone on since the beginning of time, or at least the first species that man extirpated. May this preacher’s after life be one of grizzly karma. Thanks for sharing this, Carl – great image too! It is sad, how can human beings that claim to be most sensitive of all the species talk so mean. Thanks for the energetic effort, offering perspective to someones tweaked world-view. Well said Carl, as usual. If ignorance is bliss, that moron is the happiest person around. Thanks – I should point out, perhaps, that this is the same clown who once argued that Tillikum, the orca, should be ‘stoned to death’ after killing the trainer. This type of guy just makes my blood boil. And it probably isn’t just that there is one person that thinks like this that bothers me so much, but it is with the infectious positions they hold. The CDC should have authority to quarantine individuals like this because their disease of stupidity is much more dangerous than most biological contagions.